Hello sports fans! Today is that wonderful time of the year when baseball is in full swing. On Tuesday April 15, we celebrated the incredible life of #42 Jackie Robinson, who was the first man to break baseball’s color barrier. As we celebrated this day, let’s also not forget to remember a man who was the first athlete to face the barriers of being an athlete with a physical disability. I am talking about #39, Roy Campanella. From 1948-1957, Roy Campanella was securely anchored behind home plate for the Brooklyn Dodgers. The man they called “Campy” had a ten year career in which he hit 242 home runs. He won the National League Most Valuable Player award in 1951, 1953, and 1955. He caught in five World Series. He was the first black catcher in Major League Baseball history. In 1969, he was inducted into the Baseball Hall of Fame in Coopers Town, NY. Now Campy’s Athletic accomplishments are well documented. What many of us don’t know is that Campy was in a car accident in 1958 that left him quadriplegic. This was the first time that the issues of people with disabilities became very public. Campy, since he was a high profile athlete, had to go through a life changing moment during a time when words like accessibility, adapted sports, and inclusion did not exist. Roy had to share his recovery and life with all the baseball world watching. He had to endure many barriers which included the struggles of rehabilitation, the collapse of his marriage, and the times he was lifted into baseball stadiums as a symbol of inspiration. Now as a person with a disability this can be a very difficult burden to bear. Yet, despite the pain, humiliation, and barriers, there are some incredible accomplishments from Campy that we should never forget. After his playing career ended, Campy held a job in baseball as a coach and a Community Relations Assistant. In January 1959, the Dodgers named him assistant supervisor of scouting and position coach at the team’s annual spring training camp, in which he served as a mentor and coach to young catchers. In 1978, he moved to Los Angeles and took a job as assistant to the Dodgers’ director of community relations. After his playing career, Campanella remained involved with the Dodgers, with coaching, with work, and most importantly with a life, which included a spouse and children. Today in our country the 56 million people with disabilities represent about 70% of unemployment in our country. Plus, there are many unresolved accessibility issues and inclusion barriers that are in every city and state. If we are truly advancing as a society then these barriers need to be recognized. As we remember an American hero in #42 Jackie Robinson, let’s also take time to reflect on the life of #39 Roy “Campy” Campanella. His accomplishments happened in the past yet, how profound they are today in which people with disabilities still face many barriers. These same barriers existed during Campy’s time, how amazing it will be when our nation realizes that we all can benefit when we can live in a nation that can advance beyond barriers in race, inclusion, accessibility, and opportunity. 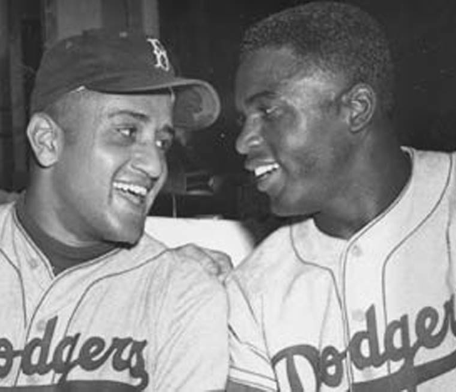 So as we celebrate, lets not forget to say thank you to #42 and #39. Who is your favorite athlete with a disability?